Like any other product and any other service, personnel qualification must also satisfy certain quality criteria. This in relation not only to the contents to be imparted but also to the way in which these contents are imparted. Additional important factors are the equipment of the educational facilities with regard to space and appliance technology as well as the qualifications of the trainers. Only when personnel qualification is based on high quality standards does the customer have the guarantee of also receiving an adquate service for his money. On behalf of DVS and upon its own responsibility, DVS-PersZert takes care of all the matters connected with the qualification of personnel according to national, European and international guidelines and standards. 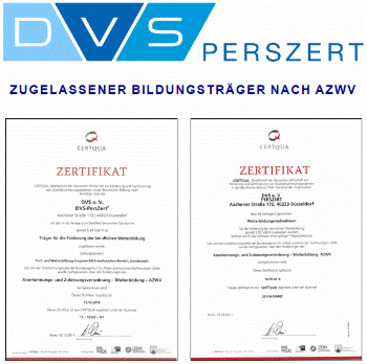 DVS-PersZert is accredited as a certification agency for personnel in the fields of joining, cutting and coating by Trägergemeinschaft für Akkreditierung GmbH (TGA), Frankfurt, for the non-regulated field and by Zentralstelle der Länder für Sicherheitstechnik (ZLS), Munich, for the regulated field according to DIN EN 45013 (in the near future: DIN EN ISO/IEC 17024). DVS-PersZert thus fulfils all the requirements on "institutions for further education measures" according to Section 84 of the Social Security Code (SGB) III in a documented form. Furthermore, the International Institute of Welding (IIW), Paris, as well as the European Federation for Welding, Joining and Cutting (EWF) have approved DVS-PersZert as an authorised national body (ANB) for the training and examination according to their guidelines.